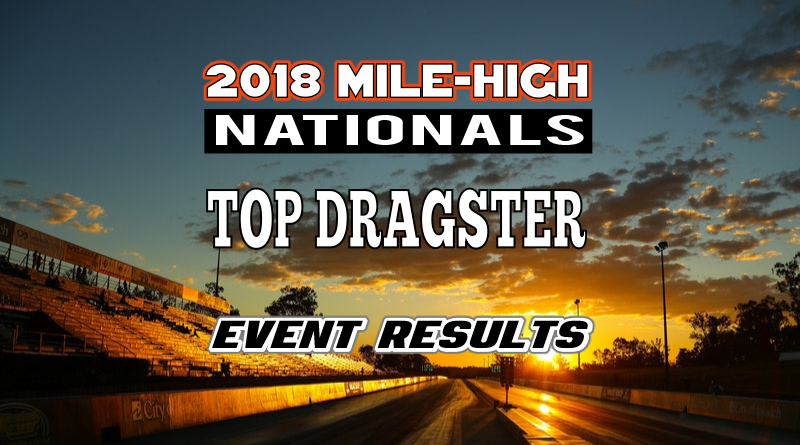 Morrison, CO – The Top Dragster final round at the recently completed NHRA Mile-High Nationals included a pair of first time finalist. Winner Rick Milinazzo of Windsor, Colorado captured his first win on NHRA’s biggest stage when he defeated Josh Herman of Pueblo, Colorado. Throughout eliminations Milinazzo used superior reaction times (.016 average) and a consistent racecar to make his way through the field. In the first round, Milinazzo earned an easy win light when D4 racer Darian Boesch ran well off his dial. Milinazzo scored another easy win in round two when opponent Don Knoblauch missed the tree with a .181 reaction. The third round saw Milinazzo meet up with D5 hitter and multi-time national event winner Jeff Koron. Milinazzo’s stellar .011 reaction gave him a huge lead off the line which he parlayed into an off-the-gas .038 over 7.478 ET to take the win when Koron took the stripe by .010, breaking out by .017. Milinazzo picked up another easy win in the semi-final round after opponent Jamie Caudill fouled by -.019. Herman’s path to the final included extremely close races in every round. Although he didn’t always leave first, Herman had good reaction times and was able to run close to his dial in each round. In round one, William Swann took an .008 starting line advantage against Herman but couldn’t run the number on the top end. Swann’s 6.545 ET on his 6.50 dial left Herman a small window at the stripe. Herman killed three hundredths at the finish line to take the stripe by .008 (about 2 feet) and earn the win. Round two saw both Herman and Brad Basgall both leave the line with “teen” lights but it was Herman who earned the win when Basgall took .020 at the stripe to break out by .003. Herman gave up the stripe, killing .03 to go .02 above the dial. The third round saw Herman take on perennial top 10 D4 runner JR Baxter. Baxter took an .009 to .021 starting line advantage but couldn’t finish the deal at the finish line as he came up .005 short at the stripe. It looks like Herman killed .02 to go .01 above while Baxter made a 213 MPH charge at the finish but still ran .03 his dial. A five thousandths stripe with 38 MPH speed difference at the finish made for an exciting race. In the semi-finals, Herman won another close race over Adam Chioda. When both driver’s left with .023 reactions, the race was decided at the finish when Herman, holding four hundreds, dumped to a dead-on zero 7.460 ET when he took .012 at the stripe. Chioda made a good lap, but his .012 over 7.902 came up a little short. With Milinazzo and Herman’s dragster’s both dialed in the 7.40 range, the final round was almost a heads-up race. Milinazzo won the battle on both ends of the track as his .019 to .039 RT provided enough room to scrub some ET (he killed about .04) at the finish to go .01 above (7.480 on his 7.47 dial) to take the win. The finish line margin was .014 (about 3 1/2 feet) as both drivers were off the gas. In the losing effort, Herman once again dropped to a dead-on pass, this time running 7.444 on his 7.44 dial-in. As usual, the Top Dragster class put on a show with tons of close races and excellent driving. Rick Milinazzo withstood a stellar field to be the last man standing on Sunday. Congratulations to Rick and his team on their first national event win!